President Trump’s first 500 days in office were outstanding. He was attacked from every side at one time and stood tall and stuck to his principles. America is stronger and better for it. Our economy is growing and the world is a safer place. President Trump kept his promises and in his first 500 days has truly Made America Great Again! Hey #Resistance this is what #WINNING looks like! President Donald J. Trump’s accomplishments his first 500 days in Office are arguably the best first 500 days of any President in US history since Washington. In spite of massive headwinds from the actions of the corrupt and criminal prior administration, the Democrat Party and their MSM, the President has stuck to his campaign promises! Below is a list of his major accomplishments. President Trump was inaugurated on January 20th, 2017, 500 days ago. Since then his accomplishments are nothing short of miraculous. In spite of massive attacks from the MSM, an investigation created through the efforts of the prior corrupt administration, and a Democrat Party that does all they can to derail him, the President kept his promises and did all he could to Make America Great Again. The results speak for themselves. The US stock market is a barometer of economic activity and since President Trump was elected it has skyrocketed. 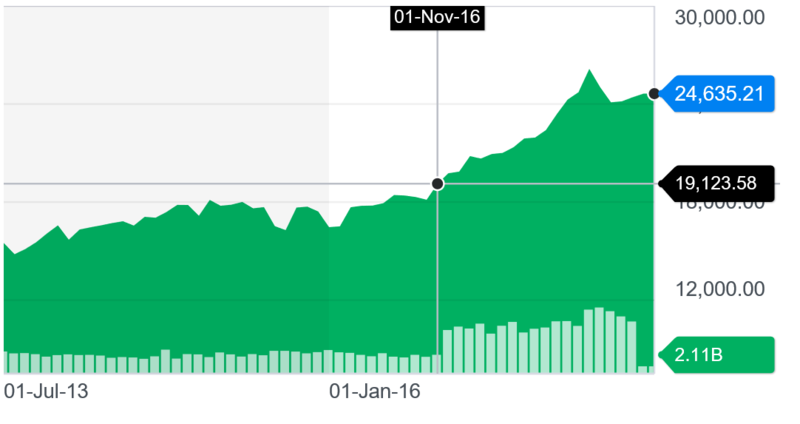 The stock market is currently up more than 33% (or a third) since President Trump won the election. The Dow has reached more than 26,000 points for the first time in its history. The Dow broke the record for the fastest 500, 1,000, 2,000, 3,000, 4,000, 5,000, 6,000 and 7,000 point increases between major milestones in the history of the Dow since Donald Trump was elected President. The Dow today stands at 24,635. It had more all-time closing highs in 2017 and the Dow increased more in 2017 than any year in history. President Trump enjoys 95 all-time highs since his election and 78 since his inauguration. The Dow, S&P 500 and Russell 2000 all set record highs since the election. Today there are more people working than at any time in US history. Under President Trump the US has set the record for the most Americans in the work force nine times. More than 155 million people are working in the US today and only 6 million Americans are unemployed, an amount not seen since 2001. Nearly 3 million jobs have been created since President Trump took office and more than 600,000 of these are related to manufacturing and construction. The GDP growth rate is expected to be 4.8% in the 2nd Quarter this year according to the Atlanta Fed. At the end of the 1st Quarter 2018 the national GDP reached nearly $20 trillion for the highest recorded GDP in US history. The President’s tax plan passed in late December and is already benefiting Americans and American companies. Employees are seeing increases in their pay due to lower Federal taxes being deducted from their paychecks. Millions of Americans have received bonuses due to the tax cuts and major companies have announced plans to move capital and operations to the US due to these cuts. The benefits of these cuts haven’t even transpired yet but the excitement amongst workers and companies is electric. The years ahead are poised to be some of the most prosperous years in US history! Overall consumer confidence is at a 17 year high as optimism about American prosperity grows! President Trump vowed to destroy ISIS. Despite President Obama saying that ISIS will be around for a generation, these murderers and terrorists in the Middle East were decimated by the end of the President’s first year in office. Both Syria and Iraq have declared victory over ISIS and due to President Trump’s resolve, less than 1,000 ISIS fighters are estimated remaining. Under President Trump, the United States has led an unprecedented global campaign to achieve the peaceful denuclearization of the Korean peninsula. His leadership has contributed to the return of 17 Americans held overseas. In May 2018 alone, Venezuela released one American and North Korea released three Americans who all came home to the United States. The President followed through on his promise to move the U.S. Embassy in Israel to Jerusalem. Now the President is preparing for a summit with North Korea next week that may end in a de-nuclearized Korean Peninsula, something unimaginable for 70 years. The President confirmed the most circuit court judges of any President in his first year, and secured Justice Neil Gorsuch’s confirmation to the United States Supreme Court. The list of POTUS 45’s successes goes on and on. Undoubtedly there is more to do. The wall is only beginning to be built and Democrats are doing all they can to stop the President’s agenda. The FBI and DOJ are headed by Obama leftovers who are involved in corrupt and criminal activities. A bogus investigation was created by these scoundrels and the current AG who recused himself from anything Russia appears to be inept and sleeping. But based on President Trump’s performance to date, he will address these issues successfully in due time as well. 2017 was certainly one of the greatest years in US history and 2018 is heading on the same track.